This year, Bell donated five cents when subscribers used the carrier’s network talk and text, as well as when non-subscribers interacted on social media using the associated Bell Let’s Talk photo filters and hashtags. Yesterday, total interactions reached 145,442,699, increasing the total to date Let’s Talk Day interactions to 1,013,915,275. Bell launched the initiative in April 2011. The telecom raised a total of $7,272,134 CAD in donations. With the new contribution, the annual event has raised a total of $100,695,763.75 CAD. That number includes Bell’s initial $50 million donation in 2011. Social media interactions went up 13 percent compared to 2018. 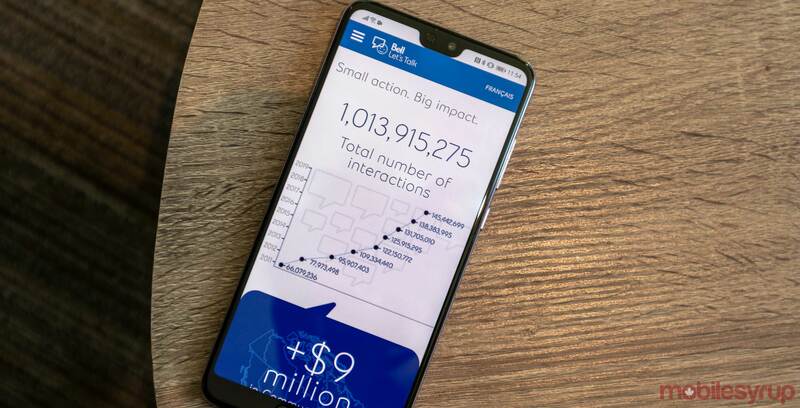 Before the day began, Bell had hoped that it would surpass 1 billion interactions. By the end of the day, the company passed that mark by 13 million. Numerous public figures and celebrities tweeted their support for the initiative. Bell has put together a website to show some of the inspiring messages. To learn more about the fundraising incentive, you can visit the Let’s Talk website to see stats, results, and the initiative’s mission statement.